Mass demonstrations in Moscow and dozens of other cities have been the most striking display of grassroots activism since the early 1990s. On December 10, in what one Russian blogger called ”The Great December Evolution”—a play on the Bolsheviks’ Great October Revolution—tens of thousands of people protested peacefully in central Moscow against fraud in the December 4 parliamentary elections. It was the most striking display of grassroots democracy and activism since the early 1990s. Police showed restraint, and Moscow’s mayor even provided free bus rides to protesters who had arrived at the wrong location. “Everything is flowing and changing,” a Russian friend e-mailed me that night. 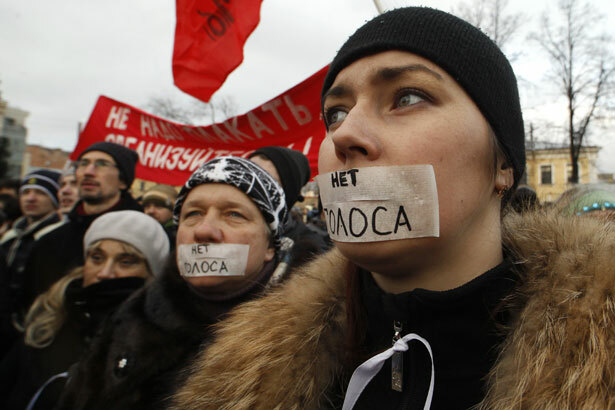 She had marched to Bolotnaya Square in a group that included Communists, liberals, anarchists and nationalists, even members of the Russian Orthodox Church—a cacophonous coalition unified, for the moment, in demanding the release of protesters arrested days earlier. Dozens of speakers railed against the government’s abuse of “administrative resources”—state television time, pork-barreling and intimidation—to ensure the victory of United Russia (though the party lost nearly a quarter of its votes from the 2007 election, when it received 64 percent, compared with this year’s 49 percent). Speakers also took delight in pointing out that such abuses could no longer be hidden. “The Internet has arrived,” was a point made to me repeatedly in Moscow when I was there in November. A new generation of web-savvy civic activists has been building a movement against official corruption but has so far avoided challenging the country’s obscene inequality and the oligarchical plundering that occurred on Boris Yeltsin’s watch in the 1990s. (This should not be surprising, considering that several of the protest leaders, including Boris Nemtsov and Mikhail “2 Percent” Kasyanov, are neoliberals implicated in that era’s corruption.) Nor are there street calls to halt the rampant capital flight—estimated at $70 billion in 2011—or to repatriate the billions parked abroad. On the other hand, the protesters do seem agitated about the corruption of Russia’s corporate and financial institutions. Putin’s handling of oligarch Mikhail Khodorkovsky’s case—which has turned him into a political martyr—may be one reason the protesters’ ire is fixed on the Kremlin, not the oligarchs. Or perhaps many see them as one and the same. Russia’s potent nationalist movement will also play a part in future developments. As in Eastern Europe, especially Hungary, Russia has recently seen a resurgence of right-wing nationalism. On National Unity Day in November, Moscow’s Russian March drew an estimated 20,000 ultra-nationalists, including some neo-Nazis, to Manezh Square, a stone’s throw from the Kremlin, where chants of “Russia for Russians” were joined with shouts to attack migrants and people from the Caucasus. One irony of the December protests is that this election may have been less fraudulent than previous ones held on Putin’s and Yeltsin’s watch. According to Gordon Hahn, a respected analyst of Russia and senior associate at the Center for Strategic and International Studies, the final results of the election did correspond to the most reliable pre-election and exit polls. (Indeed, some of those polls predicted an even higher share of votes for United Russia.) Many commentators and political figures, including those now protesting, know full well that the 1996 presidential contest between Yeltsin and Communist leader Gennady Zyganov was rigged—and that massive infusions of oligarchs’ money and state resources determined the outcome. The difference this time? The fraud and ballot stuffing were widely documented and posted online. Activists, journalists and ordinary citizens spread feisty videos that went viral on YouTube, VKontakte (Russia’s Facebook equivalent), “Tvitter” and other outlets. Unlike the regime in Beijing, Russia’s government has left the Internet (and much of the press) almost untouched, although it has imposed strict control over state television. But even on state TV there was a big change: until the massive December 10 demos, most government channels, if they reported on protests at all, tended to portray demonstrators as lawbreakers and troublemakers. But as the latest protests grew and ricocheted around the web, the three government-controlled channels led their evening broadcasts with informative reports, including interviews with people complaining that their votes had been stolen and demanding new elections. Another reason for state television’s startling shift may be the Kremlin’s interest in displaying tolerance for peaceful protest, as a contrast to Russian state TV’s near constant images of arrests and police brutality at the Occupy Wall Street encampments. Indeed, the fact that a massive and peaceful protest was taking place in Russia the same day that Boston police arrested forty-six people and evicted Occupy Boston did not go unnoticed in Russia, either on state TV or among protesters. What hasn’t changed is that Putin will likely be elected president in March. According to recent figures from the independent Levada Center, he remains popular, with roughly 60 percent support. Between now and March, the Kremlin will—no doubt learning from its experience with these elections—seek ways to split the anti-Putin vote, largely to assure that it does not go to the Communists. That may explain why Mikhail Prokhorov, the billionaire oligarch and owner of the New Jersey Nets, who recently announced he was going to challenge Putin, is considered valuable to the Kremlin, since he could divide the opposition vote. The air of inevitability that Putin has counted on for the past decade is deflated. Also gone is the nearly unconditional support most Russians felt not just for Putin but for the system he has built. While that system brought stability after the chaos and poverty of Yeltsin’s 1990s, for many Russians, especially the younger generation, that decade is a fading memory.